This is the first post in a retrospective series examining how the early work of the firm in healthcare design established deep roots for our practice. Last year, Michael Murphy of MASS Design Group invited me to give a lecture to his seminar class at the Graduate School of Design at Harvard. The course was called “The Architecture of Health: Power, Technocracy, and the Hospital, 1400-present,” and I would be presenting during week six, which the syllabus identified as “Technology & Efficiency: The Emergence of the Medical Machine, 1945-1965.” In discussing the course with Michael, I came to understand that Payette’s early hospital work from the 1960s would be important for the course, along with our seminal project with the Aga Khan University in Karachi, Pakistan. Seeing the timeframe of the course segment, I was reminded of the work by Payette’s predecessor firm, Markus & Nocka, formed in 1932 when Fred Markus and Paul Nocka left Coolidge Shepley Bulfinch and Abbott (now Shepley Bulfinch) to start their own practice. Fred and Paul hired Tom Payette straight out of the GSD in 1960, and it wasn’t until the late 1960s that the firm became Markus Nocka & Payette, and later in the 70s, simply Payette. Fred and Paul were trained as industrial engineers at MIT during the time when Taylorism, or “scientific management,” was the dominant management theory underlying manufacturing and production. 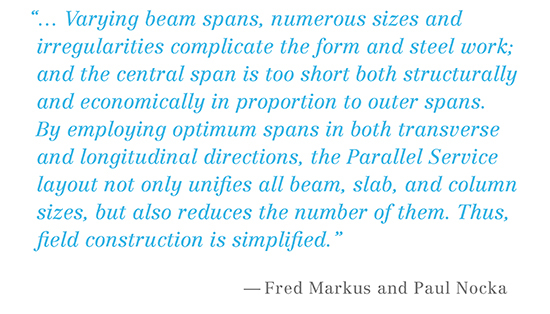 This scientific approach to design is manifest in numerous articles that Markus & Nocka published through three decades of practice. The firm brought close observation and rigorous analysis to bear on a number of problems that hospitals were facing at the time. 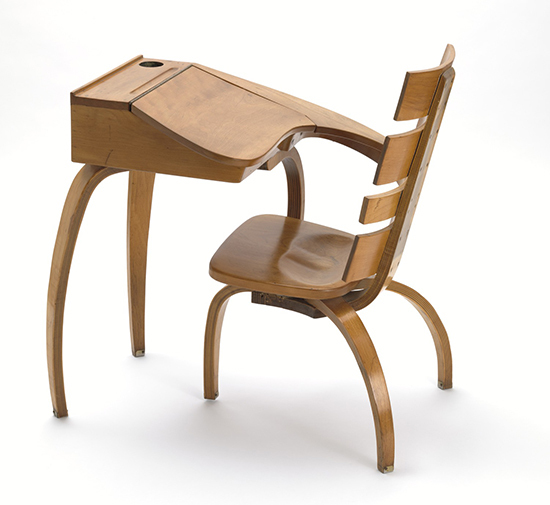 While their work was very precise and functional, there was also a strong design ethos, perhaps most in evident in the little-known prototype desk for the Bowditch School in Salem MA from 1946, which is part of MoMA’s permanent collection. 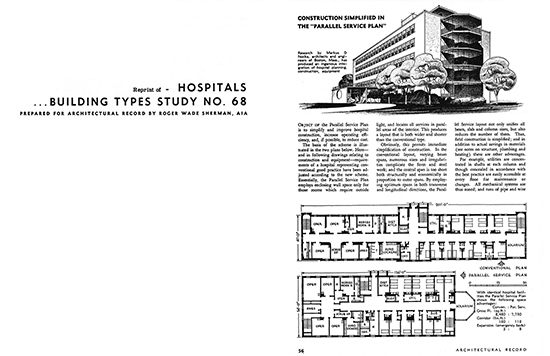 This article first appeared in Architectural Record as part of the Hospital Building Types Study No. 68, published in August 1942. 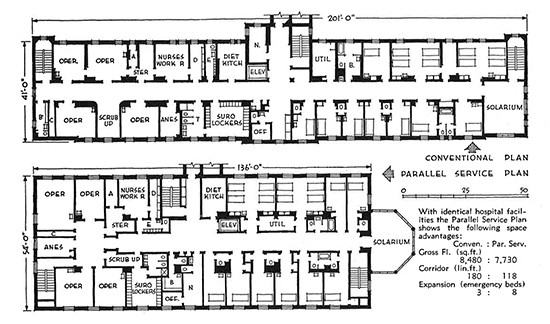 The floor plans on the first page tell most of the story: the transformation of long, thin hospital buildings into wider floor plates by laminating service-related program components (such as toilet / bath rooms, utility rooms and elevators, which do not require daylight) between patient rooms on the perimeter and the central corridor. 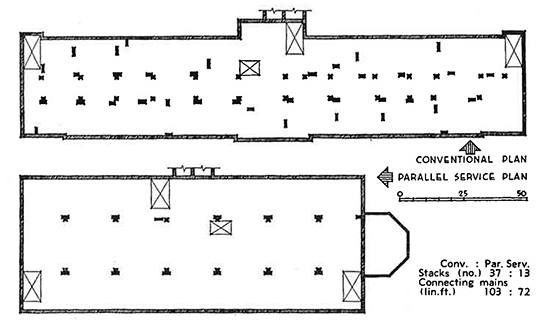 Above: floor plan comparison between the Conventional Plan and the Parallel Service Plan. Above: comparison of structural systems between the Conventional Plan and the Parallel Service Plan. The proposed structural grid has relatively short spans by today’s standards for hospital design – 17 to 20 feet as compared with 30 feet today. What is notable, however, is their focus on systematization and simplification of building structure at a time when labor was becoming increasingly expensive, foreshadowing economic imperatives that tend to dominate design and construction today. Markus & Nocka’s prototype goes further by integrating mechanical systems with the structural design, resulting in some truly innovative ideas for the time. The floor construction integrates lightweight, precast concrete blocks, which are hollow and serve as ducts for a hot-air radiant heating system. Above: isometric drawings showing the proposed integration of a hot-air radiant heating system into the structure of the Parallel Services Plan. Plumbing risers are concentrated in relatively few locations as compared with the traditional plan, and with the lamination strategy for layering service spaces inboard of patient spaces, lower ceilings in the service zone are used for horizontal distribution of ductwork, leaving high ceilings for the perimeter patient rooms. We take these organizational strategies for granted today, but they were groundbreaking in 1942. Above top: comparison of the number of plumbing stacks between the Conventional Plan and the Parallel Service Plan. 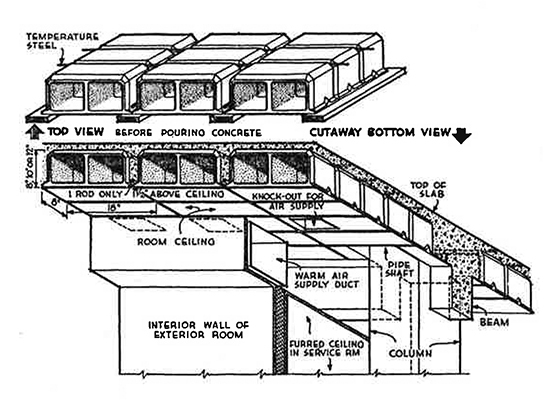 Above bottom: architectural section through the prototypical Parallel Service Plan – note the zones with low ceilings for horizontal ductwork distribution and the integration of systems. The article is a quick and enjoyable read, with straightforward prose that moves at a cheerful clip, supplemented by numerous drawings and diagrams. While it is highly focused on technical and cost considerations, a careful look at the drawings reveals a design sensibility that is centered on the human scale and patient experience. I ended up calling my lecture, “Payette Healthcare: reflecting on the humanistic imperative in a technocratic era.” It was interesting and gratifying to see that this imperative was apparent during the early years of our firm’s history, combined with an ethos of critical analysis and innovation. Future installments of this series will explore the intersection of industrial design and architecture; underlying changes in healthcare delivery at midcentury; and the Taylorist roots of Markus & Nocka’s design process.